The Guardian, in partnership with in-house creative agency OLIVER, has launched new advertising creatives to support daily news podcast, Today in Focus. Appearing on London Underground tube panels from April 8 and running for two weeks, the bespoke design was specially created with podcasting listening and commuting in mind. 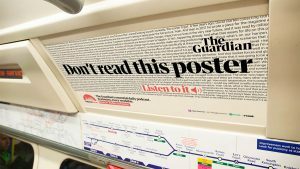 The adverts feature transcripts of audio from two recent Today in Focus episodes (one on climate change and another on Brexit) with a large font overlapping the text to direct attention towards a clear call-to-action: ‘Don’t read this poster. Listen to it’. The design plays on the tube-car setting and the benefits of listening while on the move to suggest making Today in Focus part of your everyday journey. The adverts will run across multiple tube lines in the London Underground network, with the designs adapted to appear in print in the Guardian and on social media. The Guardian’s Today in Focus launched last year and takes listeners behind the headlines for a deeper understanding of the news. In each episode, presenter Anushka Asthana examines a major news story, drawing on the expertise of Guardian journalists and correspondents from around the world.